We soon will land, and after that I suppose everything will become something over which I shall have little or no control. I am actually looking forward to that time, though I should never have thought I would. But then many of the things that have occurred in the past year I could never have predicted, and they are the very things which will make me think as I do. It will be quite pleasant to carry out someone's orders, to do what one is told. Yet, should I find myself on my own at anytime, I have enough strength, enough intelligence to rescue me. I do not worry about that, and it would be little help if I did. Anyhow, I am ready, as much as I can be ready, for what is coming. Being at sea for a month, away from all past influences, did a great deal for me in many ways. On ship, having only one companion and he so different in his tastes, I found all the time I could possibly need for thinking and reading. It was rather like waking from a nightmare with the realization that the nightmare had only been oneself. All I have done, and so much it was, to ruin myself, to hurt those who love and trust me, to cloud my eyes to everything while it was so very important for me to see, all of this I saw and realized. I thought about it over and over again, until at last the mistakes were clear, were obvious, and I could know them as mistakes myself; and to call an action a mistake has nothing to do with knowing one is. The little good that was left I have kept, and on that I must begin to build my whole new structure, nothing more or nothing less. I have a great deal of work to do. I wrote quite a bit, and very little of it is good, or I think is good, yet that will do for now. I can't alter my wish to write. That remains, and I can only adjust to it. I do believe that I shall be able to someday; I will not admit ever that it is only a dream or something which I can never realize. I think of a number of quotations, all of them admirable, which I might now use for my own life. The very obvious one is in Polonius' speech to Laertes in Act I, Sc. III of Hamlet "This above all, to thine own self be true, and it must follow as the night the day, thou canst not then be false to any man". Oh, that would help, I think, but not answer. So much more is necessary. I think of Walpole's Fortitude,1 and I remember reading it when I was quite young and almost wishing someone would beat me, so that I could be as brave as Peter Westcott. That book begins with this: "Tisn't life that matters; 'tis the courage you bring to it". And that's much more than true, and still not nearly enough. No quotation is enough. How could it be? Nothing outside oneself can ever be enough. I cannot be told, and I cannot be shown how I should live. I can only find out for myself. But I sincerely wish to hear how others have done it, to have them tell me what they have learned, for they may lead me to my own answer, though they can't actually give it to me. Enough of this. I will learn, because I must. Remembering letters I wrote in prep school, even when at Harvard, I am afraid that you will think I am insincere, verbose, because of what has preceded this. Believe me, I am not; this is not a time for that, and it was then. If I appear to take myself too seriously now, it is because for the next year and a half I shall hardly be a "self" at all. And think of the last year where I took myself seriously in such an unserious manner. I love you both much, more than I can tell you, and it will always be so. Take care of yourselves, Bob. [RC's note, upper left margin] 1The ship's library happened to have and I reread, enjoying it as much as I once did. Cooler this morning, God be praised, and letter-writing becomes an actuality instead of a hope. We're having the preliminaries to the monsoon at present-rain which comes in the later part of the day and clears about night-fall, though I'm by no means happy to see the advent of the monsoon, the respite from the heat is undeniably welcome. Working at last. I'm attached to ███████████████ and have begun to do the work I wanted to do five months ago. To give you some picture of what it consists, the following is more or less typical. About six the I.O.R.s (Indian Other Ranks) begin to chatter and make sleep for anyone within hearing range impossible. So I get up, grab the canvas bucket which someone considered a curio, get some water, and wash-the latter action is for the most part futile, because in an hour I'll be sweaty and consequently dirtier than before. Then I sit around waiting for breakfast, which, if we're in luck, means eggs, bacon or sausages perhaps, and tea, but, if we're not, it is something quite indescribable. After breakfast I try to find something to do-sweep out the ambulance, straighten out my kit, talk with anyone who will, or do what I'm doing now, anything, you see, to fill up the time between breakfast and the arrival of casualties. These come in at about nine thirty. They're treated as quickly as possible, loaded into an ambulance (we'll say mine), and taken back to the C.C.S. (Casualty Clearance Something). Now the last sentence involves a half day's work where I am at present. From our A.D.S. to the main road, which is very fortunately tarmacked, there's some four miles of bumpy, dirt road, and it's difficult to drive more than five miles an hour without making the patients very uncomfortable. And in the case of bad stomach wounds or something similar it's impossible to go that fast. Once on the tarmack I can go much faster, and in a relatively short time I've arrived at the C.C.S. some twenty miles distant (in this case). I drive up in front of "Reception", get out, and, forcing all the authority summonable into my voice, shout "stretcher bearer!" Sometimes they come, sometimes they don't. Should they not come, I go ferret them out from wherever they're sleeping and prod them into taking out my patients. Once the ambulance is clear, I simply turn around and come back to my A.D.S. and spend the rest of the day doing whatever I can find to do until it's time to sleep. The joke about waiting being the greater part of military action, as you may have gathered, is no joke out here. Luckily I've a few books and my own writing to fill out some of the blanks. (Books, understandably, make the ideal package from home.) Nevertheless, many times I think I'd have had it, had nothing happened within a few minutes later. It's literally impossible to tell you what is happening here, the atmosphere is always changing, first grotesque, then absurdly funny, now poignantly sad, and then quite pointlessly ugly. One's system of values shifts from day to day. Last night, for example, six feet from where I was sleeping, an I.O.R. was lying with his side shot away, still living after a day and a half; they could do nothing for him. Just before I fell asleep, he died and, as I was dozing off, I could hear his death rattle. But I was too tired to think about it. I suppose normally one sees very few people die, and their death means shock and great sadness. Here there is only a minute for the shake of a hand, a comment rather bitterly appropriate, and then it has passed; all of it, until the next. And who's to say even that much is not wasted? War, as well as Elizabethan drama, is a good exponent of comic relief. For me there have been infinite numbers of instances. I remember one time when I was still driving a water truck for H.Q. we could find no water point with a pump. So I with two I.O.R.s began an extremely ineffectual bucket brigade. Well, the sun was hot as I think it can ever be, and I was streaming with sweat, and the damn tank seemed bottomless. Yet I was laughing and thoroughly enjoying the situation, all because the pants of the I.O.R. in the middle fell down every time he passed the bucket up to me on the truck. Thank God for British issue butts! Please keep your letters coming-especially, Helen, ones like the last long one from you. They help so very much. And if you can find time for photographs, they'd also be appreciated. You can rely on my writing as often as it's possible.-In the meantime take care of yourselves and Sandy. P.S. I have a photograph enclosed in this letter. Hope it comes through alright. Robert Creeley is one of the most celebrated and influential American poets. A stylist of the highest order, Creeley imbued his correspondence with the literary artistry he brought to his poetry. Through his engagements with mentors such as William Carlos Williams and Ezra Pound, peers such as Charles Olson, Robert Duncan, Denise Levertov, Allen Ginsberg, and Jack Kerouac, and mentees such as Charles Bernstein, Anselm Berrigan, Ed Dorn, Susan Howe, and Tom Raworth, Creeley helped forge a new poetry that re-imagined writing for his and subsequent generations. 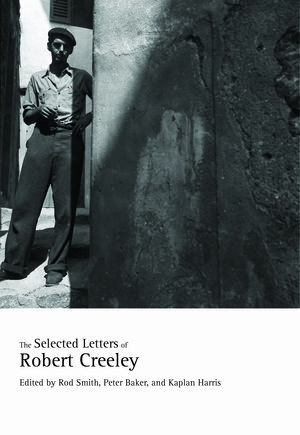 This first-ever volume of his letters, written between 1945 and 2005, document the life, work, and times of one of our greatest writers, and represent a critical archive of the development of contemporary American poetry, as well as the changing nature of letter-writing and communication in the digital era. Robert Creeley (1926—2005) published more than sixty books of poetry, prose, essays, and interviews in the United States and abroad. His many honors included the Lannan Lifetime Achievement Award, the Frost Medal, the Shelley Memorial Award, and the Bollingen Prize for Poetry. He was a member of the American Academy of Arts and Letters and Distinguished Professor in the Graduate Program in Literary Arts at Brown University. Rod Smith is the author of several collections of poetry, including Deed (2007), editor of the journal Aerial, publisher of Edge Books, and manager of Bridge Street Books in Washington, D.C.
Peter Baker is Professor of English and Cultural Studies at Towson University in Maryland. He is the author or editor of six previous volumes, including Detecting Detection: International Perspectives on the Uses of a Plot (2012). Kaplan Harris is Associate Professor of English at St. Bonaventure University. He has published widely on twentieth-century poetry, including recent articles on Susan Howe, Ted Berrigan, Hannah Weiner, and Kevin Killian.